Anna Pepper, a spicy girl! After Anna G's success, miss Pepper is born. A smiling girl always ready to spice up your life. Just fill in the vessel with grained pepper, and, turning its head around, always with a smile, you will have fresh pepper for both your cooking and your table. 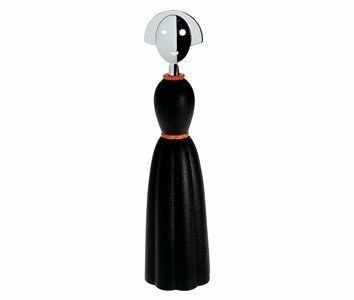 Your guests will certainly enjoy themselves with this pepper mill. Made of thermoplastic resin, with a chrom zamac and polyamide mechanism.